NES Toobin' (USA) in 07:27.58 by devanwolf. 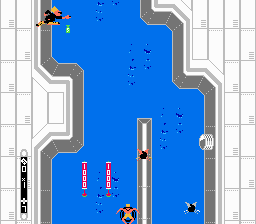 Toobin' is an unlicensed port of a 1988 Atari arcade game to the NES. Your goal is to float an inner tube down several themed rivers, avoiding obstacles and picking up collectable items. There are also warp whirlpools that can be reached if you destroy the branches surrounding them fast enough. The author, devanwolf, reaches every warp and achieves top speed in each level by staying along the bottom of the screen, finishing the game 1.41 seconds faster than his previous run.